This year I didn’t think our kids were even going to need Halloween costumes. Our son at 16 has been above such things for a few years now, and even our 13 year old twin girls seemed to be ‘meh’ on the subject. 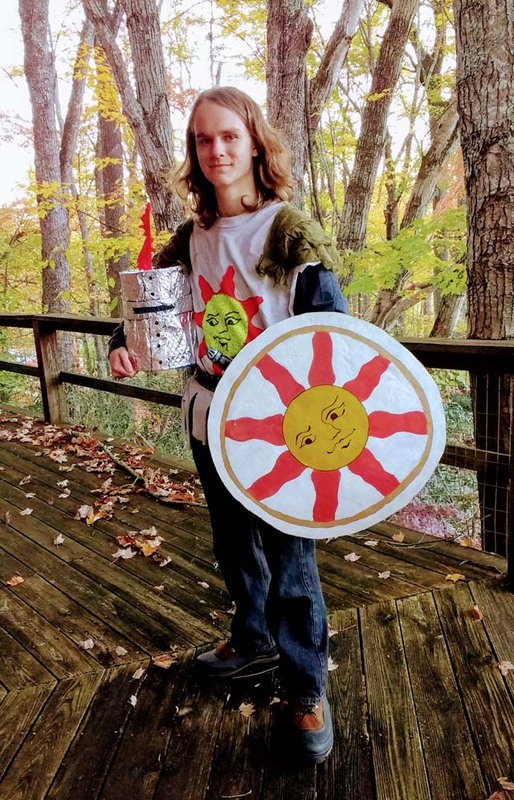 You can imagine my surprise when Tal came home from school at around 4:00 pm and announced that he needed help making a DIY Solaire costume for Halloween and he needed to leave the house to meet with some friends at 5:45 pm. He’s pretty shy and doesn’t go out much, which led me to ask myself, “Is there a girl he likes? Is that why he’s going?” In the interests of not embarrassing him in front of his sisters, I minded my own business (for once). After the initial shock I started to ask questions: Who is Solaire? What does he look like? What are the components that are absolutely vital? And why a Solaire costume? It turned out the the decision to go as Solaire – a character from the video game Dark Souls – was due to a good-natured bet with a friend. I am proud to say his friend lost the bet (evil mom-grin) AND Talbryn won first prize for best DIY Halloween costume. Oh yeah! We rocked it! Halloween costume ideas for women are pretty easy. 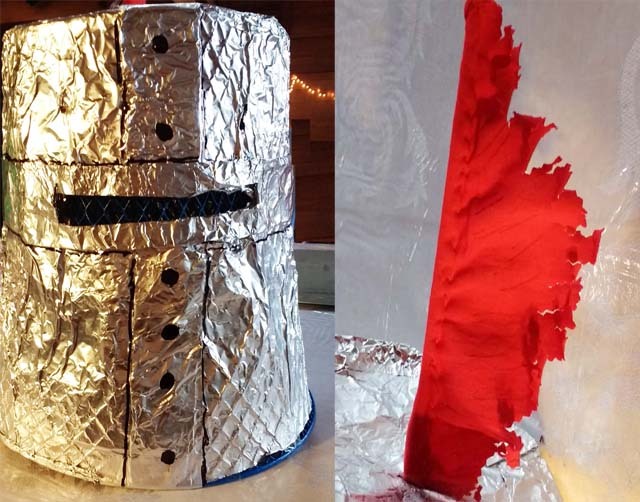 Making costumes for little kids is (generally) a piece of cake. Even men are fairly easy to ‘suit up’ with short notice. But what if your teenage son comes to you wanting a costume based on a video game character and you have less than 2 hours to make it? Apparently Dark Souls is a very popular video game franchise, but not so popular that you can nip down to the local Halloween store and buy one (if you even have a local Halloween store, which we don’t). We had to think, and think fast! Firstly, we all had to be on board. Wayne-face wasn’t home from work yet, so it was just Tal, me and the twins. The twins were thrilled to be asked for help by Big Brother and were totally on board with anything he wanted them to do. We pulled together this awesome costume with materials we had in the house, and we had a very limited time to do it. It was like a TV game show and we were going to Make. It. Happen. 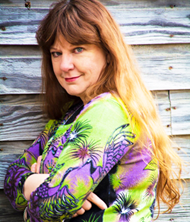 a dark grey long-sleeved shirt. Easy, he had one already. Check. grey or black pants or leggings. He had some old black jeans. These would do. Check. a greyish-white overtunic with an emblem of the sun on the front and greenish-grey shoulder thingies. Oh, my. We had our work cut out for us. As far as Halloween costumes go, this one was tricky because there were multiple components that needed to look right, and some items that needed to be painted. And dried very, very fast. The girls would work on the shield. Tal would work on the helmet. I would make the tunic and we would scavenge the rest of the items from around the house. Black pants and a grey long-sleeved shirt were a cinch. He already had those. Check. Clumpy boots were easy. The snow boots he got last Christmas and had never yet worn worked perfectly for this. Check. The sword was a stroke of luck. Just as we were getting ready to figure out how to make a convincing sword one of the twins remembered that we’d recently sorted out our basement and had a yard sale. 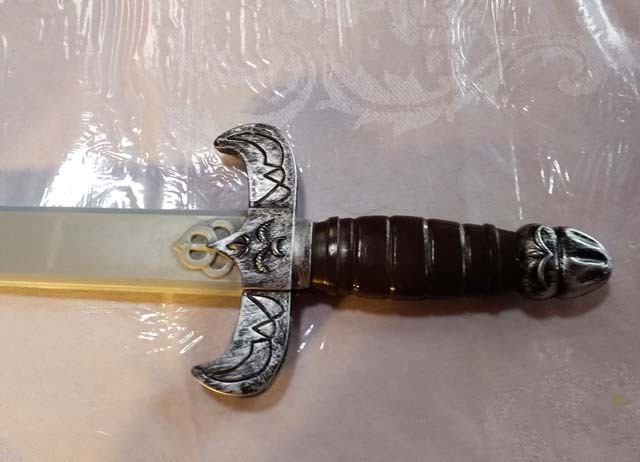 One of the things that had not sold was Tal’s toy sword from waaaay back. It was in a box in the laundry room. He grinned. That would work. The shield needed to be large and round. 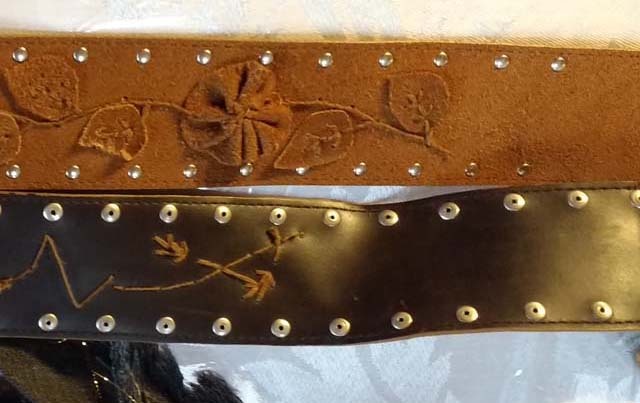 It had very specific designs on it. Tal went down to the basement and found an old tri-fold project board from a 7th grade school project. The middle section was the perfect size. We decided to wait for Wayne to actually cut out the circle but this didn’t stop the girls sketching out the pattern in pencil then getting to work painting the motif using my favorite acrylic paints. They spread a plastic table cloth on the floor and got to work. This took up the whole 90 minutes and they had to use a hair dryer to dry some parts before they could continue. By the time the shield was dry Wayne was home from work and he cut it out with a good quality box cutter. Then the three of them worked on making the “handles” at the back with pieces of extra cardboard, glue and tape. The hair dryer once again came in handy. Talbryn was beyond pleased with the result. 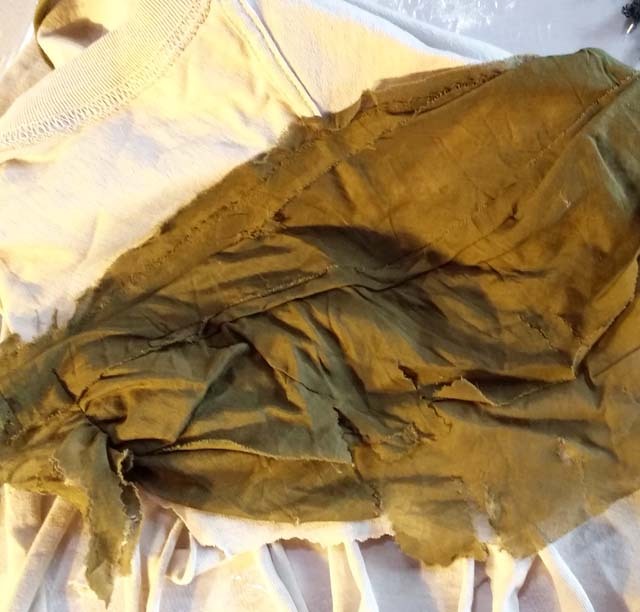 I made Solaire’s tunic by grabbing a large old greyish-white tee I had lying around. I cut along the seam up both sides all the way, including cutting open the sleeves. For the shoulder pad thingies I just grabbed two small bundles of dark green scrap fabric and chopped at it to make it look scraggy. Then I pinned one bundle on each shoulder, using safety pins. I would have sewn it if I’d had time. Then I chopped the bottom hem so it looked all scraggly. I mean – I was in a HURRY! 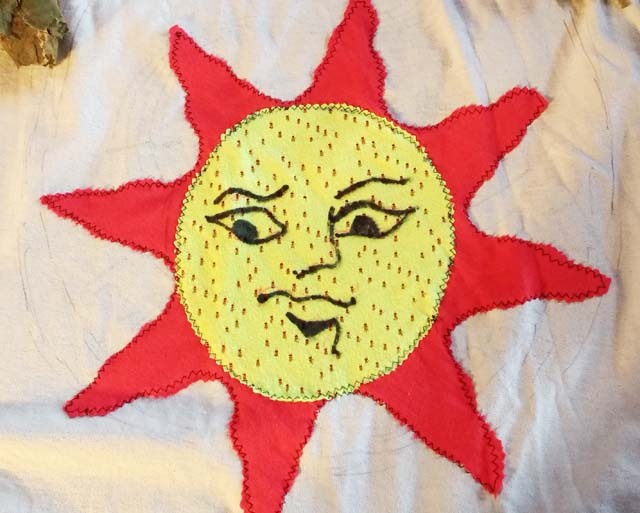 The sun motif on the front was a challenge. At first I thought I would paint it on, but the girls were using the paints and brushes and anyway, I was concerned it would be messy and not dry in time. So I decided to cut the motif out of scraps of fabric and sew it on. I was worried it would pucker as I was in too much of a hurry to pin it the way I would normally, but actually, it wasn’t too bad. I folded a piece of red tee shirt fabric into 8, and rounded it so that it was a circle. Next I drew the wiggly outlines of the rays coming out of the sun, using a vanishing fabric marker (you could use a light colored regular marker – maybe gray to look like dirt). Once I cut it out it looked pretty good! Next, I cut a circle of yellow fabric and sewed both pieces on to the front of the tee shirt using a zigzag stitch and my trusty and beloved Bernina sewing machine. It was rough but it didn’t matter – it looked fine. Then I grabbed a permanent marker and freehanded the sun’s face. You can use your disappearing marker to draw the face first if you like. Tal really liked how it looked. Talbryn’s job was to put together the helmet, and he was dead set on using my old aluminum gardening bucket. I was very un-keen on this idea for a number of reasons. First, he wanted to bash out the dent. What? That’s why I bought it in the first place. 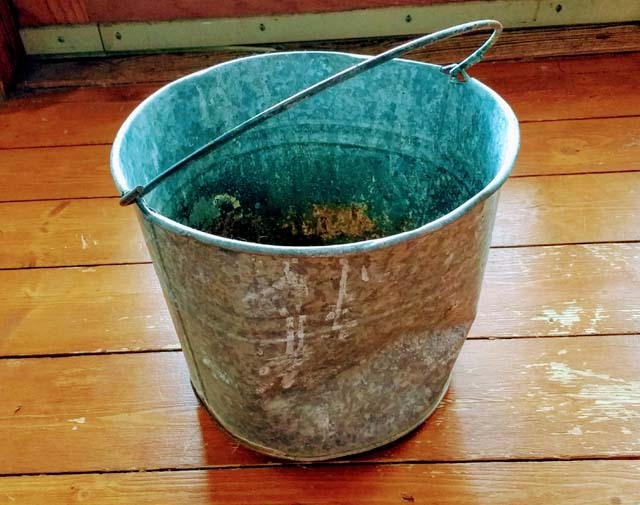 Second, it was rusty and none too clean. And third, what mother wants their kid walking around with a rusty bucket on their head not able to see where they’re going? He was dead set on it. I wasn’t going for it. “We need something that you can see through,” I pleaded. Suddenly his face lit up and he ran upstairs. Two seconds later he was back with his wastebasket and a big grin on his face. “Oh, a trash can. MUCH better,” I muttered. He got to work with some tin foil, tape and a marker, and I have to admit, he did a great job. The trash can was pretty clean (yeah, because he throws his trash on the floor) so it wasn’t a hindrance to his well-being. I could go for that. I helped him make a red feather with a stick and a scrap of red fabric and we were in business. 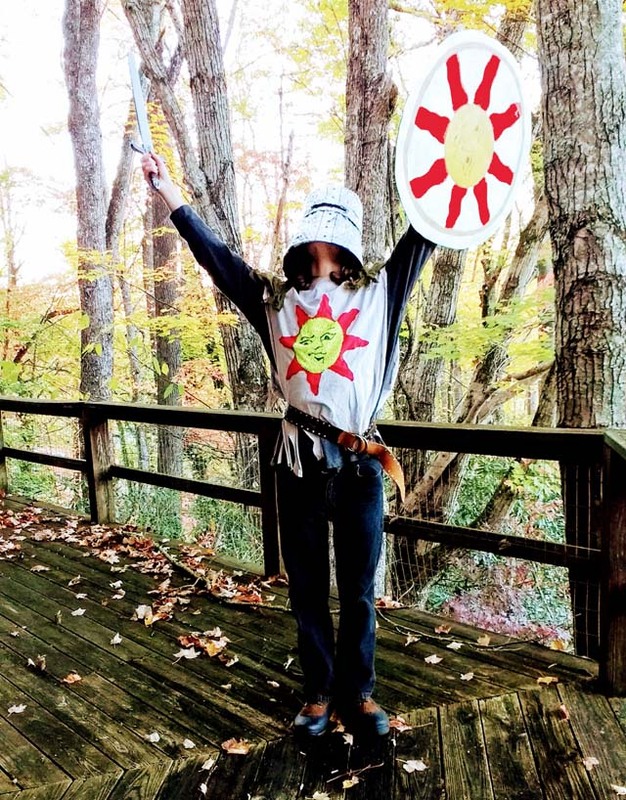 Our DIY Solaire Costume Came Together Amazingly Well! Talbryn LOVED his Solaire costume. He was thrilled with how it turned out. He even THANKED everyone in the family, including his (usually annoying) little sisters – wow! It was interesting how we pulled together as a family to get this done. It’s amazing what a challenge and a strict deadline can do for the creative juices. The kids cooperated beautifully and that made mama smile. Making this Solaire costume was a great experience for the whole family. The fact that he won first prize for best DIY Halloween costume was just the icing on the cake. How about you? Have you ever had to make a last minute Halloween costume? How did it turn out? Share your experience in the comments below. Thank you, Ty. I will. ? Wow! What a great family “project”! I love the game show analogy! You really pulled together, as you always do! Well done! It looks amazing Mandy!! Well done. The best part about Halloween is sharing these moments with the kids. Love that the whole family took part!